GET Academy (GETA) is Buhle Waste’s business unit that imparts the knowledge we have acquired over 20 years of managing waste. GETA is a training academy that has developed its own unique training material and methodology that fits the needs of the South African operational market. The Academy focusses on professionals who deal with waste on a regular basis, but for whom waste is not a core part of their business. GETA seeks to empower our clients through accredited and recognized training – professionals can enhance their skills base and organizations can contribute to their skills development requirements. 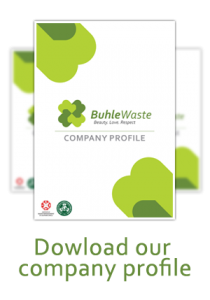 Buhle Waste, in partnership with GeoZone, have developed a training programme for health care personnel to equip them with the necessary knowledge and skills for effective medical waste management and segregation practices. This training is accredited with the Health and Welfare SETA (HWSETA) providing trainees with NQF Certification (Level 1 and 4 qualifications). The training is accredited by the Health Profession’s Council of South Africa (HPCSA), with 4 Continuing Education Units (CEU) allocated to the program. The training has reduced the total amount of health care risk waste to treatment by 2 – 6% where it is implemented as a result of improved segregation practices; reducing the cost of treatment to the waste generator and minimizing the healthcare facilities’ impact on the environment. This is currently one of the few SETA Accredited courses offered by a waste management service provider in the country. Buhle Waste is in the process of researching the potential uses and added benefits of the Converter’s waste treatment’s final by-product. Initial research has indicated that the by-product from this process produces more energy than that of coal. Buhle Waste is researching methods to use this by-product as a fuel source, which can then potentially allow major waste generators to engage in a waste-to-energy project that could see them providing their own fuel source. Buhle Waste believes that this new technology will usher South Africa into a new era of waste management, changing our very understanding of the way in which waste can be managed. It is through this process that we can begin to realise zero waste to landfills. We are very excited by these prospects in the management of waste in South Africa. OMPECO and BP share our excitement and are teaming up with us for the waste-to-energy technology in the country.